1963 was a big year for instrumental guitar music, particularly surf music. “Pipeline” by The Chantays, “Wipeout” by The Surfaris, “Bombora ” by The Atlantics , “Dance On” and “Foot Tapper” by The Shadows all topped the charts. 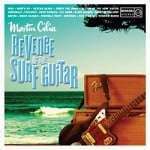 Inspired by “that sound“, Martin Cilia, guitarist with legendary Australian surf band, The Atlantics, has taken a step into the solo spotlight with the release of “Revenge Of The Surf Guitar“. This 16 track CD is his tribute to early sixties surf guitar music. A true labour of love, Martin wrote all tracks, played the majority of instruments and produced the project. 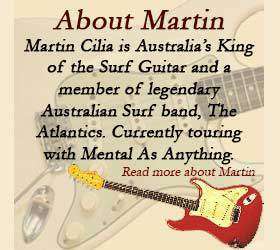 An avid collector of classic electric guitars and amps and always a perfectionist, Martin’s unique playing ability is complimented by the sounds of some exceptional instruments: a 1963 candy apple red Fender Stratocaster, a 63 black Fender Jaguar, a 63 Fender Vibroverb, a 63 Fender Outboard Reverb Tank and a 63 Fender Jazz Bass. “All of these instruments just happen to be from 1963. This was not planned. It just worked out that way because they all had a unique sound that attracted me. I played the Jaguar on 95% of this CD. This is the first time I have used a Jaguar and discovered an amazing sound“. Highly regarded surf music critic, Phil Dirt of ReverbCentral.com in Santa Cruz, California has rated it 5 stars. “This album is solid top to bottom…very fresh and powerful … Martin Cilia has produced a wonderful CD with 16 wonderful tracks … this album is very, VERY well done. Highly recommended“.